The upcoming HTC flagship is expected to have a 5.5-inch QHD display, Qualcomm Snapdragon 805 processor, 16 MP rear camera and up to 128 GB internal storage. 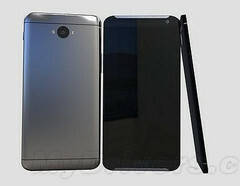 The next-gen HTC One flagship device may be close to its official unveiling - at least if the latest rumors become reality. Nevertheless, the most recent leak concerning HTC One M9 reveals the main specs of this upcoming Android smartphone. The device will be larger than its predecessor and will feature a 16 MP camera with optical image stabilization which ditches HTC's Ultra Pixel technology. Insiders familiar with HTC's plans also mentioned that HTC One M9 may feature Bose audio technology with dual front speakers. Unfortunately, they did not say anything about the front camera which is clearly visible in the leaked image published by Chinese website MyDrivers.com at the end of last week. HTC One M9 is still far from its launch date, as most sources expect it to be unveiled in Barcelona, at the MWC 2015 event that takes place in early March.